Projects Abroad’s Sea Turtle and Coastal Conservation Project on Mexico’s Pacific Coast recently marked its first full year partnering with El Tortugario de Cuyutlán, a centre for sea turtle and estuary protection, which focuses on research and environmental education in local communities. After 11 years at El Chupadero, our previous Sea Turtle and Coastal Conservation Project site, beach erosion threatened the campsite where local staff and volunteers stayed while working at the project, and the project was forced to relocate to Cuyutlán, a small town roughly 50 kilometres north of El Chupadero. “The reason for the change was the geographical zone where we were located,” states Rene Diaz, a long-time local staff member on the project. “Each year the beach was being pushed and eroded, and it was losing about three to four metres on average annually.” In 2015, Hurricane Patricia also took six to seven metres of beach with it when it made landfall to the north of the campsite. Both costal erosion and super storms are consequences of a warming Pacific Ocean. The Sea Turtle and Coastal Conservation Project is committed to protecting sea turtle species that lay their eggs on this stretch of Mexico’s Pacific coastline. 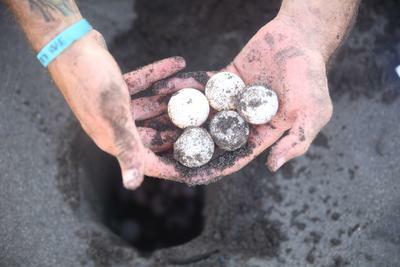 In addition to coastal erosion, among the greatest threats to sea turtle populations on Mexico’s Pacific coast are poachers who sell the turtle eggs on the local market. To protect local turtle populations from poachers, our volunteers carry out nightly beach patrols, during which they recover nests, collect turtle eggs and rebury them in a protected corral where they can hatch and then be released safely into the ocean. 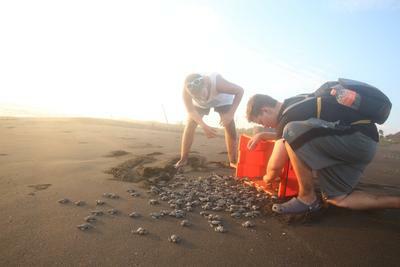 Since opening the project 12 years ago in El Chupadero, volunteers have collected eggs from nearly 30,000 nests and released over two million hatchlings into the ocean. The move to a new location, though challenging, has been a success. The partnership with El Tortugario (Unidad de Vida Silvestre Centro Ecológico de Cuyutlán: El Tortugario) has allowed Projects Abroad to continue to focus on conserving and protecting sea turtles. Volunteers work together with local biologists to protect the eggs of green sea turtles, olive ridley sea turtles and leatherback sea turtles (which are located in nests along the beaches) and can get involved with community education efforts. 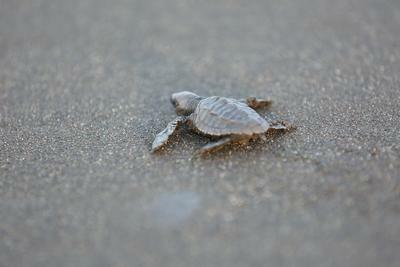 “There is no conservation without education,” states Maricruz Rivera, Director of El Tortugario de Cuyutlán. For this reason, the centre focuses not only on hands-on conservation work, but also on raising awareness about the importance of environmental conservation in the local community. These awareness campaigns do not only focus on sea turtle conservation, but also include the protection of the unique flora and fauna of the Palo Verde estuary, where El Tortugario is located. Find out how you can contribute to our Conservation Project in Mexico or take a look at some of our other Conservation & Environment placements around the world.